Clara wants her sister to be happy and helps her to elope. The scandal that follows has a devastating effect on her own future though. Clara never expected her parents to say yes to a marriage request of a dangerous abusive man. Baron Rutherford has made it clear that he will own her and wouldn't hesitate to use violence to make her follow his orders. Clara wants to escape this terrible fate and runs away. To make sure nobody will find her, she pretends she's a maid named Helen and ends up being part of Lord Ashworth's household staff. William is the new Earl of Ashworth. He lost most of his family and is grieving deeply. He's living a secluded life and doesn't want to take part in any activities other members of the ton are inviting him for. When William meets Helen, he finally feels something more than just despair. His beautiful servant keeps surprising him and he can't seem to stay away from her. However, Earls don't marry their servants. What should he do? What will happen when William finds out Helen is actually Clara, do they have any chance at happiness together? Lady in Waiting is a fantastic romantic story. I was completely mesmerized by this amazing book and couldn't put it down. Clara is a strong and capable woman. She's looking after the people she loves in any way she can. This also means she supports the kindhearted, but very sad William, even though she works for him she manages to get through to him and I loved their beautiful open connection. It's clear from the start that there are plenty of sparks between them, but their circumstances are far from ideal. William has no idea who she is and Clara can't risk being exposed, but she keeps standing out. I couldn't turn the pages quickly enough to find out how their story would end. I was captivated by every single sentence. Marie Tremayne has written a terrific regency story. It's filled with intrigue, secrets and true love. Clara's bold behavior kept putting a smile on my face, she's a fabulous heroine. I liked her story from beginning to end and enjoyed every part of her journey towards a better future. I loved the chemistry between the main characters and greatly admired Clara's courage to approach William over and over again. The way William runs his household makes it possible for them to form a bond, he's chivalrous and he's a real gentleman, someone any woman would be lucky to be with. It was fun to see the world of the ton from two different sides and I equally loved each one. Lady in Waiting is a delightful entertaining story, I highly recommend this wonderful book. If you love regency romance Lady in Waiting is an absolute must-read. Marie Tremayne graduated from the University of Washington with a B.A. in English Language and Literature. While there, a copy of Pride and Prejudice ended up changing her life, and she decided to study the great books of the Regency and Victorian eras. Now she enjoys writing her own tales set in the historical period she loves. Lady in Waiting is Marie Tremayne’s debut romance novel and was a finalist in the GSRWA’s 2014 Emerald City Opener Contest. Its sequel, The Viscount Can Wait, was a finalist in the 2015 ECO Contest. Marie lives with her family in the beautiful Pacific Northwest. I graduated college with the intention of using my English degree to teach grade school. Things were put on pause with the arrival of my two awesome kids, and my plans changed again when I decided to try my hand at writing romance! I also work at a dance studio, and in my free time I enjoy reading, taking walks (but not jogging...never jogging! ), and spending time with family. 2) Where does your love for historical romance come from? 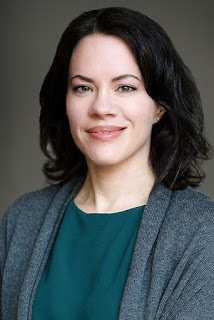 While Jane Austen opened my eyes to her amazing books and others of that period, modern-day Lisa Kleypas did the same to draw me into the historical romance genre. Specifically, her wonderful Wallflower series was what got me thinking about trying to write books of my own. 3) Can you describe the main characters of Lady in Waiting in nine words each? 4) Clara is a lady who has to go into service to escape a terrible fate, what’s the inspiration behind her situation? I've always been fascinated by the upstairs/downstairs dynamics of Regency and Victorian England. I was intrigued by the peerage, but I was also interested in the people who toiled every single day to make daily life possible for them. Before long, I found myself putting the two together in what I hoped was a very romantic pairing. 5) If you could travel back in time, where would you go, what time would you visit and what would you wear? That's easy. I'd go back to Victorian era England and wear all those amazing dresses, even the petticoats, although I'd probably take a hard pass on the corsets. This answer is especially ironic since I pretty much never EVER wear dresses! 6) What does true love mean to you? More than anything, I think it means mutual respect and understanding. I can't envision a version of true love without either of those things. 7) Pride and Prejudice changed your life, can you tell a bit more about this? When I was a sophomore in college, I came down with pneumonia. I was laid up for weeks, and a good friend of mine came by with a book for me to read. It was Pride & Prejudice. My first reaction was not good...I didn't feel like slogging through some old book...but I was stuck in bed! So I gave it a chance and I ended up loving it. In fact, I liked it so much that I started taking all the Regency and Victorian literature classes I could find. It gave me such an appreciation for that historical time period, and for those authors who wrote with such skill and wit. 8) Which characteristics should a true gentleman have? In relationships, I think a gentleman is a man who is secure enough in himself that he can allow his partner the freedom to express themselves without worry or restraint. I think his partner and their needs will always be on his mind to some extent. I am also a little old fashioned! If a man takes the time to hold the door open for me, then regardless of the fact that I can hold that door open myself, I will consider it gentlemanly. There's no need for heroics, but I do appreciate chivalry when it happens. 9) In the past women didn’t have much to say, how do you still give them power over their own destiny? One of the things I love about historical romance is how the heroines each possess their own unique voice, and we get to watch them wield it in order to achieve the life they desire. I don't believe modern readers are interested in shrinking violets who are afraid to speak up for themselves. They want to read about women who, while they may be victims of circumstance to some degree, are still unafraid to live a life of their own choosing. Gotta keep writing - I'm working on the last book in The Reluctant Brides series now, and I can't wait to share them all with the world! 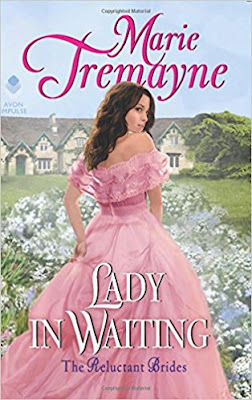 One very lucky reader of With Love for Books will receive a digital copy of Lady in Waiting by Marie Tremayne. Lady in Waiting sounds like a must-read, Victorian-era romance novel. I love a good bodice-ripper, and this looks fabulous!! This does sound like a wonderful book, as you note, a terrific regency story, filled with intrigue, secrets and true love. Wow! I love the beautiful cover! Love the sound of this. :) The cover is gorgeous, and I would pick it up purely based on that and love the dress too. Definitely one to share with my sister - she loves a good ol' bodice-ripper!